Ext JS includes components that can contain other components are called container. You can add, insert or remove components from the container and also arrange child components using different layouts. Ext.container.Container is a base class for all the containers in Ext JS. You can add different types of Ext JS components into a container using items config property or add() method. Note: Container can also include another container. The following example demonstrates how to add components into a container using items config as well as add() method. In the above example, comp3 and comp4 are added into container1 using items config property whereas container2 includes comp1 and comp2. The container1 also adds container2 using add() method. The above example would be resulted as below. Note: Containers are same in Ext JS 4.x, 5.x and 6.x. The only difference is that the incremental version provides more config properties and methods. The following table lists all important containers in Ext JS 6. Ext.container.Viewport viewport ViewPort is a specialized container representing the viewable application area (the browser viewport). Generally there is a single ViewPort in an Ext JS application which will define the application's main areas like north, west, south, east and center. container container Container is lightweight container which provides basic functionality of containing items, namely adding, inserting and removing items. So use this container when you just want to add other components and arrange them. Ext.panel.Panel panel Panel is a special type of container that has specific functionality and components. Each panel has header, tool, body, toolbar components. So use Panel when you want specific user interface with header, toolbar and body part. Do not use it if you do not want these features in panel, use container instead. Ext.form.Panel form Ext.form.Panel provides standard containers for form. Use it when you want standard application form kind of user interface. Ext.form.FieldContainer fieldcontainer FieldContainer implements labelable mixins so that it can be rendered with label and error message around every sub-item component. You can use fieldcontainer in the form to arrange inner fields. Ext.form.FieldSet fieldset Fieldset is a container for group of fields in an Ext.form.Panel. Ext.grid.Panel grid Grid displays large amount of tabular data with sorting, filtering and other functionality. Ext.container.ButtonGroup buttongroup ButtonGroup provides a container for arranging a group of related Buttons in a tabular manner. 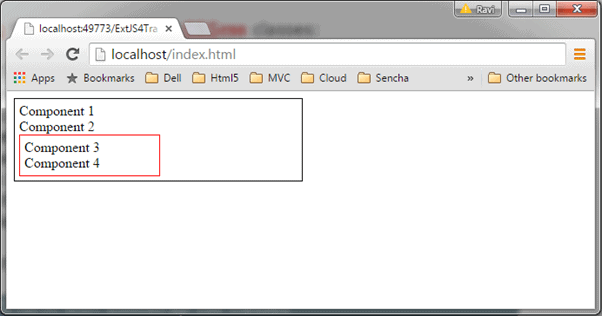 Ext.tab.Panel tabpanel Ext.tab.Panel is a basic tab container. Use it when you want tab or wizard in your user interface. Ext.tree.Panel treepanel TreePanel provides tree-structured UI representation of tree-structured data. Ext.menu.Menu menu Menu is a container to which you can add Menu Items. Ext.toolbar.Toolbar toolbar Toolbar is a container for toolbar buttons, text, fill, item etc. Ext JS provides different types of layouts to arrange child components into a container. Learn about the layouts in the next section.